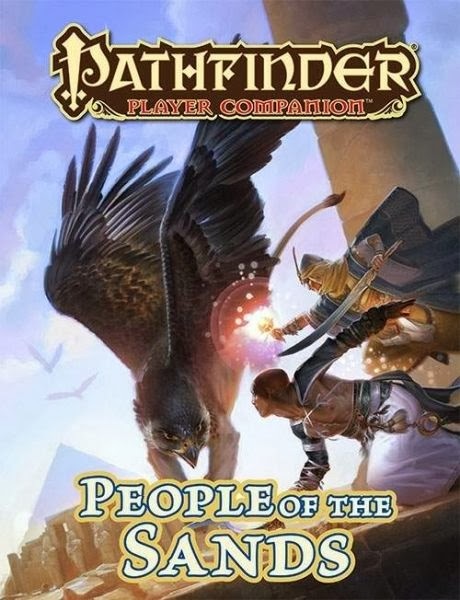 This month Paizo is giving us a look at some of the desert nations of Garund with its latest Player Companion: People of the Sands. This prelude to the upcoming desert-set adventure path The Mummy's Mask details the nations of Rahadoum, Thuvia and Osirion as well as its peoples and magical traditions. In addition to these books, Paizo Fans United will be publishing Wayfinder issue #10, featuring a plethora of desert-themed supplements for your Mummy's Mask campaign and beyond. My excitement levels for The Mummy's Mask are reaching critical levels and in order to join in on the tomb-crawling, desert-exploring fun I thought I'd share a few desert-themed articles over the next two installments of System Shock and Pop Creature! These pieces were originally going to be submitted to Wayfinder for issue #10, but had to be put on the back burner well beyond the submission deadline due to other obligations and holiday-related shenanigans. Now that the holidays are over and my plate has started to clear up, I'll be putting the finishing touches on the remainder of these articles. Today, we'll be taking a look at the sandshaper summoner archetype. Feel free to voice your opinions in the comments! The vastness of the desert allows many secrets to remain hidden. Traditions of magic lost to time with the fall of ancient desert civilizations, yet are revealed briefly by the whim of the winds, only to be once more swallowed up by the hungry sands. The tradition of sandshaping—a magic craft of summoning elemental forces to animate sand into living creatures—is one such lost art. Only a handful of sandshapers persist in secretive communities scattered in the remote deserts of the world, using their power over the element of earth to become master of the ancient sands. A sandshaper has the following class features. Weapon and Armor Proficiency A sandshaper is proficient with all simple weapons as well as light armor, but not shields. He may cast summoner spells without risk of spell-failure while wearing light armor, but suffers the normal penalties for spell-failure in Medium or Heavy armor. This replaces a normal summoner's weapon and armor proficiencies. Diminished Spellcasting A sandshaper may cast one fewer spell of each level than normal. If this reduces the number to 0, he may cast spells of that level only if his Charisma allows bonus spells of that level. Sandcraft (Su) At 1st level, as a standard action, a sandshaper may touch an area of unworked earth to sculpt a single object of up to 10 pounds in weight, such as a longsword, crowbar, or buckler. The object remains in this form for 10 minutes per sandshaper level or until broken or destroyed, at which point it crumbles back into sand. Items created in this fashion have the fragile quality and the base hardness and hit points of an object made from stone. At 3rd level, sandcraft objects are considered masterwork, no longer possess the fragile quality, and gain 2 points of hardness and 5 hit points. Every two levels thereafter the sandcraft object gains an additional 2 points of hardness and 5 hit points. At 5th level sandcraft weapons and armor have a +1 enhancement bonus, and this bonus increases by +1 for every 4 levels thereafter. A sandcraft item that leaves a sandshaper's possession for more than 1 round is destroyed. This replaces a summoner's Summon Monster class ability. Sandshaped Eidolon A sandshaped eidolon is a creature made of living sand called from the elemental plane of earth and sculpted by the sandshaper's imagination. They always appear to be made from sand and earth with a single, glowing glyph on their brow much like normal eidolons. Sandshaped eidolons are outsiders with the elemental and earth subtypes, gaining all of the traits of that subtype in additional the the normal traits of an eidolon. Additionally, whenever a sandshaper gains a level of summoner he may change the chosen base form for his sandshaped eidolon. This new base form persists until the sandshaper gains another summoner level, at which point he is free to change it again. This otherwise works like and replaces the eidolon ability of a normal summoner.